As a new teacher, you are going be overwhelmed and make mistakes. One I urge you to avoid is the extra credit trap. Avoid at all costs. It creates entitled students and burdens you with a ton of unnecessary, time consuming work. 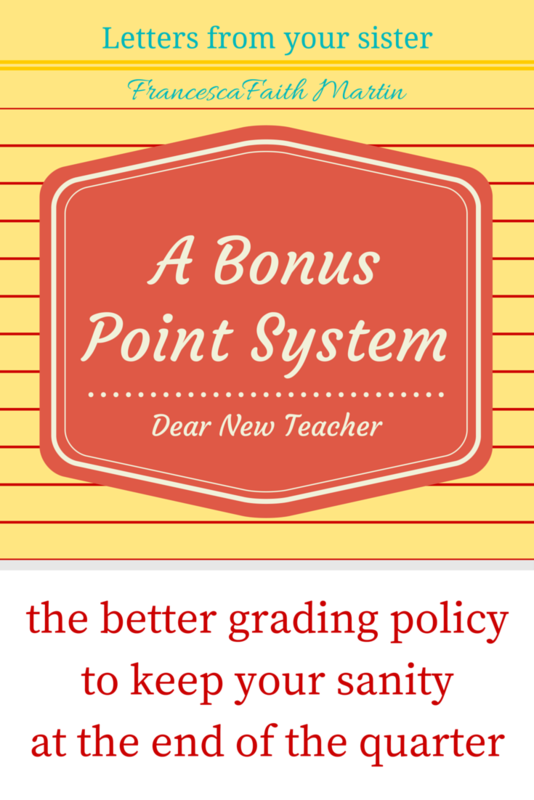 Creating a bonus points system will help you to stay clear of this burdensome pitfall were so many new teachers fall. John the football star went to his parents, who went to the teacher and principal to get his english teacher to give him extra credit assignment so he could play in the big game on Friday. He was only a few points from passing anyway. As many new teachers, completely overwhelmed, it seems easier to just be flexible and hand out ONE extra credit assignment. What harm, right? The very next day, Joe, Larry, and Pete came and asked for the same thing. Adrianna the A student asked the following day. Her mom was upset that she had not taken advantage of the assignment, because she saw John’s mom’s post on facebook that he was passing English and knew he bombed the last test. If Adrianna didn’t get the assignment counted she, and he it sounded like, were going to hear about it. And low. The new rookie. Staying up late. Friday night. The last day of the quarter, grading and scrambling and calculating to get the grades adjusted for the 10th time after all the assigned course work in his syllabus was indeed completed at the beginning of the week. My syllabus that specifically states “there will be NO extra credit”. Have you found yourself in a similar scenario as above? Try implementing these 5 suggestions in order to prevent spending the last day the quarter attached to your grade book. Make sure it is written in a syllabus, parents are aware, and there is no discussion beyond the signature saying they have read and understand the syllabus. Make your administrator aware that this is your policy. Review it with them and if there are any issues with school policy adjust accordingly then. There is always that ONE student who will ask or who you will be tempted to just say “here” take the extra credit. You want everyone to do their best and you want them to have every opportunity. Handing out extra credit to anyone who asks takes too much time and effort on your part to create, grade, and calculate student averages. It is also unfair to the other students who don’t have the same leg up. If they miss an assignment or do poorly, conference with them right away or contact their parents so everyone is aware and there are not end of the quarter surprises. If you are going to offer an assignment to one student, you must be prepared to allow anyone to give the assignment. Its just not fair. I found great value of implementing a bonus point system into my syllabus. This gives you the flexibility to be charitably to students, while still maintaining your standards. Kids need to be taught kindness as well as be held accountable. Handouts are unkind but pre established opportunities are generous, allowing students the chance to own and fix their mistakes. These bonus points are when students complete specified assignments* or earn them through outstanding class participation**. *Extra assignments You could create a list of assignments and dates at the beginning of the semester, or take assignments during the week. The day before it is due, give students the option of you turning in the assignment for a grade. **Class participation These are handed out randomly for outstanding classroom participation or are received when bonus questions are answered correctly. Make sure students are aware that they can achieve these and have high standards for them. This is an effective classroom management tool that usually creates a little friendly competition, fostering student engagement and makes class time fun for students. Scheduling a pacing day before assignments are due is a proactive way to keep an eye on student progress throughout the quarter. Pacing days allow for students to regroup, reorganize, and tie up loose ends if there are any. Its a day to make-up work, ask questions, study, or SSR. Most valuable about these days is you are accessible to the students to conference one on one without having to stay after school or get a pass during the day. Its a day for you to check up on everyone, answer questions, and take time to assess student progress. Be organized about it. Hold conferences one on one. Take two periods if need be to reach everyone. Make it clear that students are to be working. Give a bonus assignment on one of these days and make it mandatory if the student is not going to use their time otherwise. Communication and organization early in the year will enable you to give students every opportunity without having to turn to extra credit. Hold your ground compassionately but firmly. When a student has failed, show them where they went wrong, show them what to do in the future, and encourage them that there will be a next time and to try again. Tell them you believe they can do better and they will. Allow them the space to fail and learn from their mistakes.